High Fidelity Produces More Expressive Avatars! 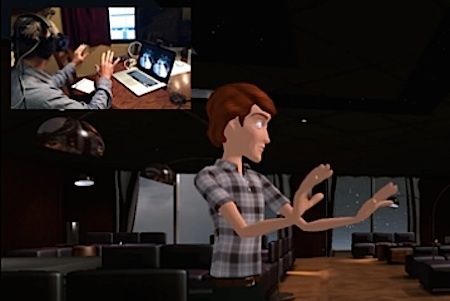 Tired of those wooden, blank-faced avatars in your virtual reality world? High Fidelity, a San Francisco start-up, has figured out a way to be more expressive, virtually. Philip Rosedale is telling me about his new company, but I can’t stop myself from looking down at my hands. With palms up, I watch with fascination as I slowly wiggle my fingers and form the “OK” sign. I curl my hands into fists as I reach my arms out in front. They look pinker than normal but work as usual. When I look back up at Rosedale, he’s wearing a smile, and his eyebrows rise slightly. “Isn’t it cool?” he says. In my right ear, I hear a quiet chuckle from one of his colleagues, Ryan Karpf, standing just outside my vision. It is cool, because nothing that I’m seeing is real. Though our conversation appears to be happening in a tastefully lit club, I am actually sitting in front of a laptop in a San Francisco office wearing a virtual-reality headset and headphones. I’m trying out a new platform for virtual worlds in development by Rosedale’s startup, High Fidelity. When I put on the virtual-reality goggles, I saw the view from my avatar’s eyes; as I moved my head, motion sensors in the goggles controlled the movements of the avatar’s head. Moving my hands in the real world controlled the avatar’s hands, thanks to an infrared motion sensor mounted on the front of the headset. I could gesture for emphasis, and look from person to person as the conversation flowed or my attention drifted. More important, I could get a read on what Rosedale and Karpf were thinking as they spoke or listened—because their head movements and facial expressions mirrored what their real bodies were doing. Each had logged in from a laptop with a small 3-D camera perched on its screen; the camera captured their expressions, down to eye blinks and lip movements. Their virtual mouths synched with their real words. After the initial unfamiliarity wore off, chatting with Rosedale and Karpf in virtual space was much the same as it would have been in real space. Lots of science fiction fans first encountered the idea of an "avatar" in the 1992 novel Snow Crash by Neal Stephenson. As Hiro approaches the street, he sees two couples probably using their parent's computer for a double date in the Metaverse. He's not seeing real people, of course. It's all part of a moving illustration created by his computer from specifications coming down the fiber optic cable. These people are pieces of software called avatars. They are the audiovisual bodies that people use to communicate with each other in the Metaverse. An avatar is an incarnation of a deity in human form; the literal meaning of the Sanskrit word is "he passes or crosses down." It is taken from Hindu philosophy. Just as the deity "passes down" from the higher realms of being to the simpler realm of the material Earth, so a person becomes an avatar in a simpler computer-generated reality. 'had he not been talking into a hush-a-phone which he had plugged into the telephone jack...' - Robert Heinlein, 1940. '... an instrument having relatively small bit pieces adapted to be gripped between the teeth.' - Hugo Gernsback, 1923. '...A paper thin polycarbon screen unfurled.' - William Gibson, 1986. 'I used my implant to tell MILLIE what we wanted and she took care of it' - Pournelle and Niven, 1981.